Judy is from the North East of England where she trained in radiography in the early 1980’s and gained a post-graduate qualification in Diagnostic Ultrasound in 1989. In 1990 she became Chief Sonographer at the Freeman Hospital in Newcastle before moving to Tasmania, Australia as Chief Sonographer at the Royal Hobart Hospital. 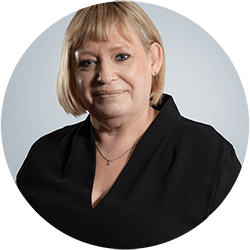 On return to the UK in 1998, Judy became Ultrasound Superintendent at The Royal Surrey County Hospital in Guildford where she met Prof. Mark Whiteley and set up a vascular ultrasound service. Judy and Mark performed the UK’s first minimally invasive varicose vein procedure in March 1999. Their mutual interest in diagnosis and treatment of complex varicose veins led to the inception of The Whiteley Clinic in 2003. Judy is now Chief Sonographer at The Whiteley Clinic and has a specialist interest in the diagnosis of pelvic and ovarian varicose veins in addition to ultrasound guidance of minimally invasive varicose vein treatment. NCBI – A description of the ‘smile sign’ and multi-pass technique for endovenous laser ablation of large diameter great saphenous veins. NCBI – Symptomatic recurrent varicose veins due to primary avalvular varicose anomalies (PAVA): A previously unreported cause of recurrence.